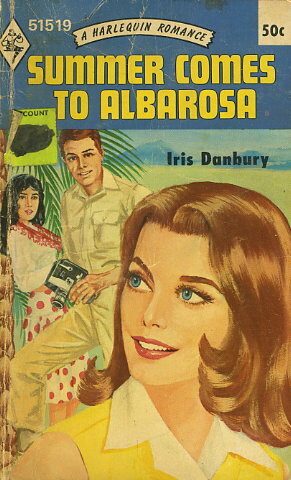 Caran decided she was going to enjoy her summer job in Spain, especially once she had met the romantic, and very attentive, Don Ramior Mendosa. But she could well have done without that maddening Englishman, Brooke Eldridge! Caran felt sure she was going to enjoy her new job at Albarosa, in the lovely Spanish province of Andalucia, looking after a number of holiday villas in a beautiful, away-from-it-all resort. She felt even more optimistic when she met the romantic Don Ramiro Mendosa, who was so attentive. However, Caran thought crossly, she could well have done without that maddening Englishman Brooke Eldridge. With his fits of temper, his kindness to the local Spanish people, his blow-hot-blow-cold behaviour, he was quite impossible, and Caran really didn't know why she wasted a moment's thought on him. Then the whole problem looked like being decided for her anyway, when her glamorous friend Julie descended on her for a long holiday and proceeded to annex every man in sight - Brooke Eldridge included!